Every time I return to Boston, I just have to revisit Quincy Market. It is a stroll through the kitchens of all continents and you may get a free nibble here and there. When I visited September 15th 2008, I got a small skewer with teriyaki chicken, New England Clam Chowder and a small taste of an Indian curry. What is left is all the delicacies on display. There and then I wished I had appetite for three as walking there is a feast for the eye. I will take you through a small walk in Quincy Market and show you a little of what this great food market has to offer. Quincy Market has been around nearly 200 years. As the city of Boston grew so did the the demand for shopping space. 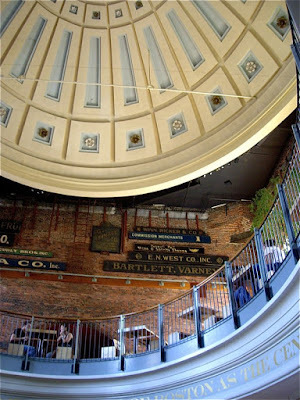 This prompted the construction of Quincy Market, and the process was initiated and organized by Boston mayor Josiah Quincy III (1772-1864), thus the new market was named after him. Since then, food has been sold to the citizens of Boston here in small shops and stalls. Baklava - sweets from Bosporus! 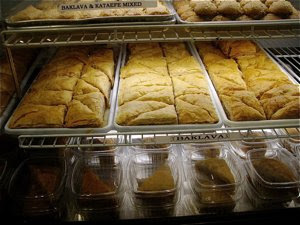 I always associate Baklava with Turkey. This sweet, multi-layered cake made from thin phyllo dough, nuts, and honey, is definitely a treat for the carb-junkie, as it will seriously boost your glucose level. I do not eat more than one slice of Baklava myself, but enjoyed with a strong glass of Turkish tea it is a delicious treat. Here displayed in one of the middle eastern stalls at Quincy Market it certainly looks as good as it tastes, doesn't it? There are few things more typical to New England than Lobsters. Found in abundance in the cool waters outside the North Eastern coast, makes this delicacy more affordable here than in other parts of the world. At Quincy Market you are offered lobster in any shape or form. You can get cold lobster, warm lobster or as here in a lobster roll. 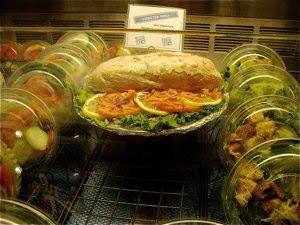 A lobster roll is most often a fine roll, sliced in two and filled with a salad made from lobster meat, mayonnaise, and celery. In other parts of the world you are often offered small quantities of lobster meat, when ordering a dish made from this delicacy but as according to the saying "everything is bigger in America", this applies even to the portions of New England lobster served in a bun. They contain a decent amount of succulent meat. Wraps are easy food to eat. This is a package in its own right, as you may eat the content and the wrapping for lunch. Convenient for those in a hurry as well as for the hungry tourist. 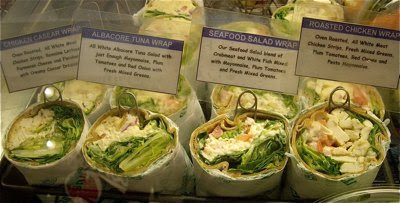 At a seafood stall at Quincy Market I found these four different wraps on display. I still get hungry looking at them. Chicken Caesar Wrap. Oven roasted. All white meat. Chicken strips. Romain lettuce. Parmesan cheese and finished with creamy caesar dressing. I get dizzy. I love Caesar Salad, but I would have loved to have a few of those crunchy croutons as well, but let us face it, they would have turned soggy. Albacore Tuna Wrap. All white Albacore Tuna Salad with just enough Mayonnaise. Plum tomatoes and red onions with fresh mixed greens. Fresh tuna has the texture of real beef, and is lean and healthy, but it will certainly not be ruined by some mayo! Seafood salad wrap. Our seafood salad blend of crab meat and white fish mixed with Mayonnaise. Plum tomatoes and fresh mixed greens. Roasted chicken wrap. Oven roasted. All white meat. Chicken strips. Plum tomatoes, red onions fresh mixed greens and pesto mayonnaise. What a great idea mix pesto and mayonnaise!! Now you have the recipe! Make them yourself! Great idea for a picnic or as an easy lunch. I will certainly be inspired to try. For those of you concerned with healthy living, a carrot cake may sound like a healthy treat, but I can ensure you, it is not. It is more the choice for carb-junkies, as the mere sight of it will wake that urge. Carrot cake is, in fact far sweeter than many other cakes I know, and is topped with an equally sticky frosting. Grated carrots are mixed into the batter and will release its sweetness as it softens during baking. 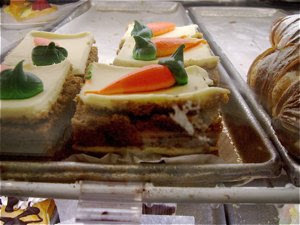 Here at Quincy Market carb-junkies are offered a slice of this sweet sticky treat, with a small carrot made from marzipan (?) on top. Eat you heart out, Bugs bunny!!! I am really not into cakes, with one exception - I simply love cheesecake. Its creamy succulent consistency flavoured with lemon, strawberry or other fruits. There is nowhere better to enjoy a cheesecake than the US. 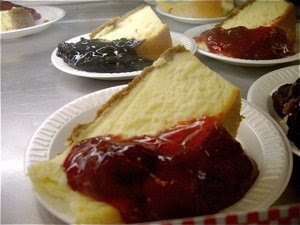 There is a wide range of different varieties offered made with different cheeses and flavors, as this one, served with strawberry jam. Boston foodstories: Quincy Market: Calzone, pizza benvenuto alla cucina italiana! Boston foodstories: Seafood at Quincy Market: Seafood is my favourite, and at quincy market you can get fish, crustacaens, and shellfish prepared in every possible way. What wine to serve to parma ham?